Eleven female American bison now share hundreds of acres to roam and graze thanks to a new attempt to restore a population that used to flourish across North America. The freed bison, eight from Blue Mounds State Park in Minnesota and three from the Minnesota Zoo, feverishly ran to their new home at Minneopa State Park on Friday. A video captured their excitement. The state park is working alongside the Minnesota Department of Natural Resources (DNR) on this project in an attempt to give life back to a very rare population of bison. But in order to understand what exactly makes these bison so rare, we have to uncover the history of their species and, in particular, what is now allowing the population to recover from such devastating losses. Before North America was claimed by European settlers, these lands were once home to an estimated 20-30 million bison. To nobody's surprise, years of habitat loss and unregulated hunting led the population to plummet to just over 1,000 bison in the year 1889, according to Defenders of Wildlife. Over the last century, conservation efforts have grown the bison population from barely four digits to 500,000 individuals. However, much of the bison population's current success is due to the practice of cross-breeding with cattle. Although we have half-a-million bison today across North America, only a mere 20,000 have exclusively bison genes. The partnership between DNR and Minneopa aims to grow this population. The other 480,000 may resemble bison, but they are different in some ways, according to Tony Fisher, director of animal collections at the Minnesota Zoo - for example, cross-bred bison don't grow as large as their purebred counterparts. The introduction of these 11 American bison also has the potential to reshape the landscape at Minneopa State Park, in addition to expanding the natural bison population. By grazing over grass and kicking up soil, these bison will bring a biodiversity to the park that goes far beyond their own species. The move also seems to be a positive change for the 11 bison's quality of life. No longer confined to a small area inside the zoo, the bison will have more opportunities to explore in their new 330-acre home. Visitors of the state park gathered on Friday to watch the bison and share their enthusiasm for the bisons' new home. "As a Dakota person," spectator Glenn Wasicuna told a local news station, "I feel this is part of my healing process ... bison coming back here." For the next month, the park plans to keep the bison private until they are more fully integrated into their new home. In October, visitors will be permitted to observe the bison, and at some point next year, a bull will be introduced into the herd, in the hopes of at least partially, restoring the once thriving bison population in America. Friday marked a joyous day for these 11 bison as they ran toward a new chapter of their lives. 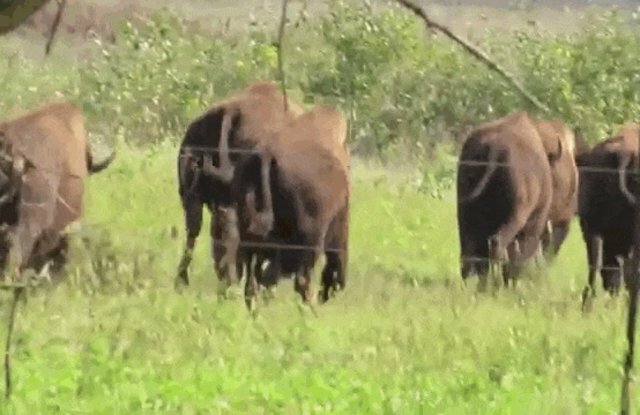 Watch the full video of the bison's first few moments of freedom below.